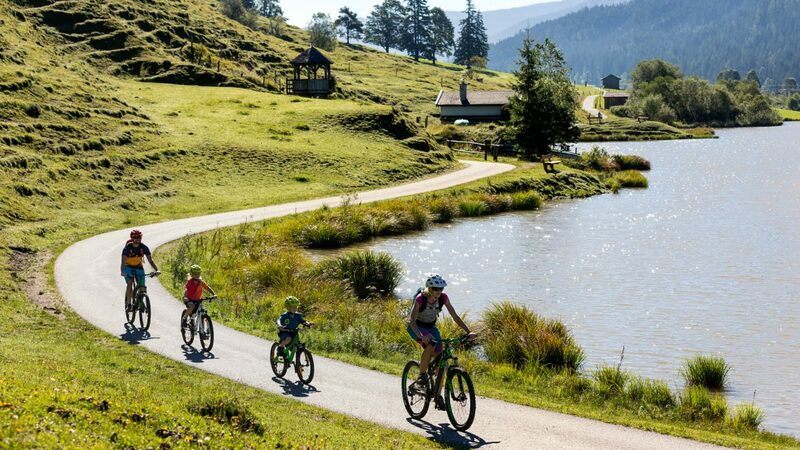 Leave the hustle and bustle of everyday life behind you on a bike, experience the beauty of the country and spend carefree hours on the cycle paths of SalzburgerLand - here cyclists are always exactly in the right place. Whether you just take a comfortable day trip, several days on one of the beautiful bike paths in SalzburgerLand, or even on a cross-border trip – cycling is one of the most beautiful things that you experience during the summer months and is becoming ever more popular. Rightly so, as we think! You sit in the saddle and delight at the passing landscape. The wind gently breezes through your hair and you just feel good. My dear heart – what more do you want? So that you can always experience something new, there is a vast network of cycling trails in SalzburgerLand which guarantees everyone finds their perfect one. ©Klemens König – Family biking in Saalfelden Leogang. There is something for everyone here on the top 7 cycling routes in SalzburgerLand. Whether you are looking for a relaxing bike ride along deep blue lakes and rivers, searching for a challenge on the high Alpine mountain passes or simply wanting to glide past picturesque valleys with views of lush hills and imposing peaks. The Tauern Bike Path, Mozart Bike Path, Alpe Adria Bike Path, Enns Bike Path, Salzkammergut Bike Path, Mur Bike Path, Slow Bike Tour – they all are beautiful, scenicly interesting and across borders. For that great adventure in the saddle! The Tauern Bike Path and the Alpe Adria Bike Path are incidentally included in the complete European Cycle Route Network and part of the Euro Velo 7 route, which leads from the North Cap down to Malta. The nickname ‘The Sun Route’ could not have been better chosen. There are 25 regional bike paths, in addition to the 7 major routes that pass through our county and also sometimes have their starting point here. These are the three great river bike paths, Enns, Mur and Tauern Bike Paths along the Salzach and Saalach rivers. Each one of them is exciting in its own way as they lead you through the remotest areas of SalzburgerLand. This is just the best way to get to know the county and the people as they really are. Around the Untersberg Mountain, the Glemm Valley Bike Path or the Mitterberg circuit are just some of these regional cycling routes on which you are guaranteed such insights. Or would you rather indulge your passion for cycling away from the main spots? Then, our great cycling insider tips are just what you are looking for! In order that you do not have to take care of anything during your holidays in SalzburgerLand, and every desire will literally be read from lips before you say it, there are lots of bike-friendly businesses and bike hotels all across the region. They offer everything you could ever need, and are thus incomparable to the normal places which accommodate cyclists. Because here, almost everything is just about two wheels. And of course, just that what cyclists really need for their holidays. E-Biking in SalzburgerLand has enjoyed ever more popularity in recent years and for many of us opens up the possibility to experience new places that were previously reserved only for serious athletes on their racing bikes. In order to promote and even improve this trend, more and more E-Bike charging stations are springing up all around SalzburgerLand. This will ensure that you will also not miss the electric tail wind.